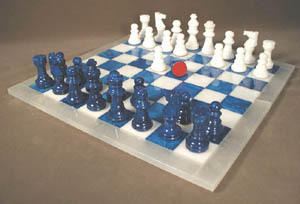 The alabaster chess sets that we offer on our website are of exceptional quality. Made from high end polished alabaster stone, a material which is often used in statues and jewelry, these chess sets are the absolute height of quality and sophistication. This particular set features a soft blue tone against a snow white stone, to create a very lovely, easy going effect. The colors do not contrast violently, instead they flow in a simple, peaceful sort of harmony, which only serves to enhance the quiet dignity of the sets. As you gaze across the board you can peer closely into every blue square and you will see a completely different vision in each and every one. As volatile as the ocean which they seem to depict, each square has its own one of a kind nature, with unique patterns flowing across the perfect polished surface of the stone. These unique qualities carry on into the pieces, flowing up through them and giving each blue piece its own individual set of characteristics and quirks. Meanwhile, standing in opposition to this wild individuality of blue swirls, stands the white half of the board. These white squares are perfect, snow white visions of never changing purity which stand stalwartly against the stresses of time and entropy. While they do miss out on some of the individuality of the blue pieces, the white half has its own draw. The understated and subtle power of perfection is something which can truly change the nature of a space. However the true power of this set is that it can merge both unique individuality and stark perfection, to create a soft balance which stretches out across the face of this lovely home accessory. This entry was posted on Friday, July 17th, 2009 at 12:46 pm	and is filed under Chess. You can follow any responses to this entry through the RSS 2.0 feed. You can leave a response, or trackback from your own site.